2016 marks the one hundred and first anniversary of the Armenian Genocide. Beginning on April 24, 1915 and continuing through the duration of the First World War, the horrific event began with the mass imprisonment of Armenian leaders and intellectuals in Constantinople (present day Istanbul) by the Ottoman regime. 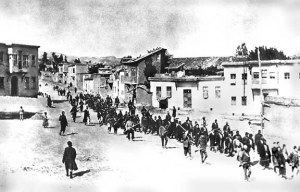 Over the next several years, the Armenian population living within the Ottoman Empire was subjected to numerous atrocities, carried out with the objective of extermination. Throughout the atrocity, Armenian men were placed into forced labor camps and systematically executed while the women, children, and elderly were rounded up into forced “death marches” that led them into the surrounding desert. By 1918, approximately one million Armenians had lost their lives to the genocide, a figure that represented about 70% of the Armenian population in the region. The Polish-Jewish lawyer and namesake of our seminars in Poland, Raphael Lemkin, was heavily motivated by both the brutality of the Armenian Genocide and the impunity enjoyed by those responsible. The atrocity played a significant role in his development of the concept of genocide – a term that he is responsible for coining – and his campaign for its universal criminalization in the mid 20th century.